Saturday September 10th 1881 It was raining hard this morning and I got work enough about to last me all day, I made May another apron besides doing some other work. It cleared of in the afternoon and Mother and Bridget both went to town. 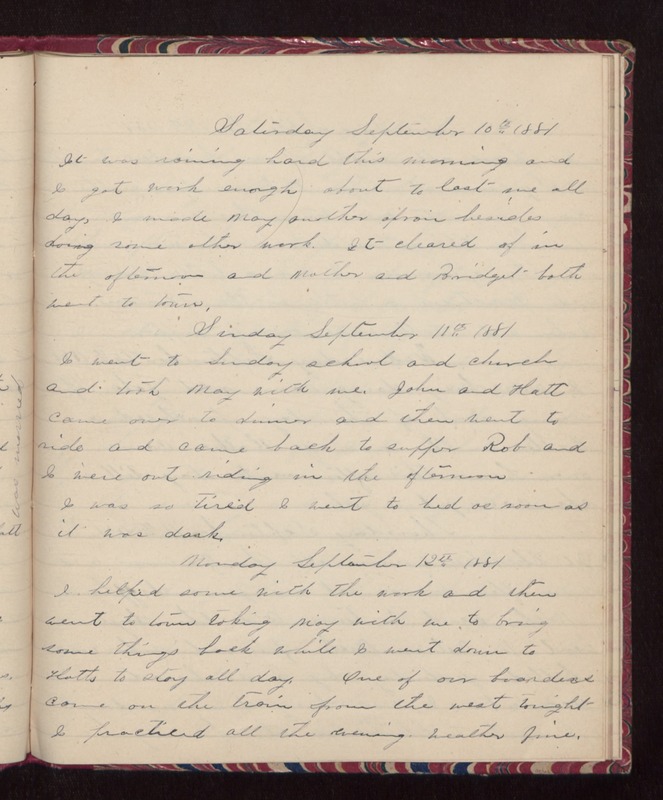 Sunday September 11th 1881 I went to Sunday school and church and took May with me. John and Hatt came over to dinner and then went to ride and came back to supper. Rob and I were out riding in the afternoon. I was so tired I went to bed as soon as it was dark. Monday September 12th 1881 I helped some with the work and then went to town taking May with me to bring some things back while I went down to Hatts to stay all day. One of our boarders came on the train from the west tonight. I practiced all the evening. Weather fine.